Global-store Crochet Hooks Set --The Best Quality and Value Ergonomic Crochet Hooks Set! 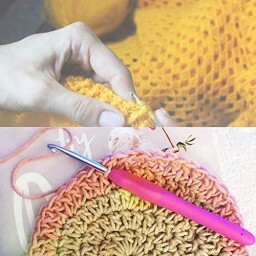 Crochet for Longer With No Hand Pain Or Your Money Back! 【Crochet Hooks Set】Include 12pcs differents sizes hooks(2.0mm, 2.5mm, 3.0mm, 3.5mm, 4.0mm, 4.5mm, 5.0mm, 5.5mm, 6.0mm, 6.5mm, 7.0mm, 8.0mm),3pcs blunt needles and 10pcs marker pins, a perfect set great for any beginner or advanced crocheter, as this set covers the most popular sizes to get you started! 【Extra Long Crochet Hooks】High quality aluminium crochet hooks with colourful soft rubber grip non-stick, non-slip handles for comfortable long period use; the tapered tips keep your yarn in place, resulting in nice even stitches, a marvelous and distinctive gift that will be used and appreciated by anyone who receives it. 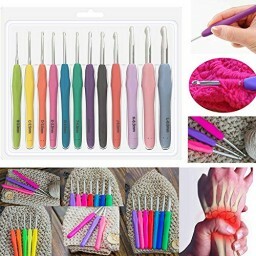 【No Hand Fatigue】The super comfortable and lightweight ergonomic crochet handle design means less pressure; makes this crochet set great for reduce & eliminate arthritis, carpal tunnel and cramping in your hands, wrists and fingers. You can crochet faster and longer with these crochet hooks. 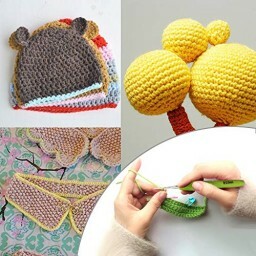 【Colour Coded for Easy to Distinguish and Use】Every hook is color coded and printed with both letters and numbers, you'll never be confused which hook works best for which knitting loop so you're prepared for any pattern; they are for anyone who wants to crochet with comfort and ease. 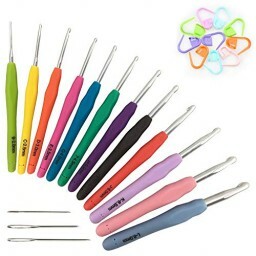 【Ideal for Family Crocheting Knitting】Smooth aluminium hooks-all knitting tools are kept in quality case, which is easily to carry around and keep; you can teach your children to crochet in this hook set carry on family traditions; from a basic chain to an advance post stitch, our hooks set would make our proud.